Learning how to cut a mango is a skill anyone can acquire. Mangoes, the delicious gourmet tropical fruits, flummox even the best chef. Like many exotic fruit, digging into a mango isn't as easy as biting into a juicy apple or peach. However, learning the techniques to cut up a ripe mango are well worth the time and effort to teach yourself the new skill. There are several challenges to cutting up a mango. First, there's the peel or skin that must be removed without tearing off half the succulent fruit. Next, the hard, fibrous pit inside the mango is notorious for catching knives and sometimes snapping a knife if the point gets stuck in it. Lastly, how do you cut the mango and get the most tender flesh off the pit? 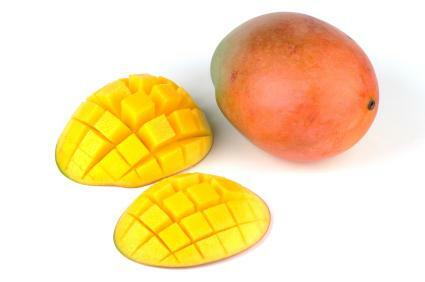 Here's a step by step guide to proper mango preparation. Before assembling the tools to cut a mango, you'll need a ripe mango. Many people dislike mangoes because they've tasted unripe fruit. Don't judge a mango by its color. Mangoes come in a wide range of colors from a green to a bright orange. Some mangoes even have many colors in their skin including green, yellow and orange. A mango's color is determined by the variety of tree that produced the fruit and the place where it's grown. Even something like a red tint on the skin which in other fruits hints at ripeness just means that the mango received some direct sunlight while it was developing. To see if a mango is ripe, just give it a gentle squeeze. It should feel soft to the touch but not squishy. If you're shopping for mangoes, you may want to buy a firmer mango and let it ripen for several days on the counter top. Once it feels soft, transfer it to the refrigerator to keep it from ripening any further. Assemble a clean cutting board, sharp knife, a clean bowl, and a compost or garbage bowl for any leftover pieces. Make sure that you wash the mango thoroughly. Wash your hands too, especially if you've been preparing other food such as meat, chicken or fish right before cutting up a mango. There are several ways to cut up a mango. Some people like to peel a mango using a vegetable peeler. Place the peeled mango on a cutting board and cleanly slice away chunks from the tough inner core. Discard core and peels or compost them. This method is tricky because mangoes are juicy and slippery to peel, but if the two methods below intimidate you, try to peel and slice it like an apple. You may not get as much flesh off of the mango, nor will it be the cleanest cut, but you can still enjoy the fruit this way. Place the clean mango on the cutting board with the stem side facing down. Cut around the mango in a firm line. Flip the mango over and repeat. You're left with two slices called cheeks. Cut around the center portion again, avoiding the thick, fibrous center. Slice in long lines through the cheeks. Using a spoon, simply scoop the flesh out into the clean bowl. Discard the fibrous center and the skins from the cheeks into the compost pile or garbage. The second method is to cut the cheeks off the mango, make slices, and flip it inside out. Then you can easily cut the chunks of fruit off. Here's how to flip a mango. Cut around the mango in a firm line. Flip the mango over and repeat. The resulting sections are the cheeks. With the sharp knife, cut lines horizontally and vertically through the flesh side of the cheeks to make a checkerboard of squares. Do this on both cheeks. Grasp the cheek of the mango in your hands. Gently push it inside out so that the checkerboard squares are standing out. Use your knife and carefully scrape the square pieces of mango out and into a bowl. For those who truly love mangoes, the cooking industry has come up with a gourmet gadget called a mango splitter to make your life easier. The mango splitter removes the fleshy inner core from the fruit in one fell swoop, leaving you with the cheeks cleanly cut away and ready for the Scoop or Flip methods. Find mango splitters at gourmet kitchen stores or online.Enjoy mangoes fresh as a delicious snack, in a fruit salad, or in the many recipes that call for this delightful, if a bit intimidating, tropical fruit.